Deep in the woods of Maine, the Revolutionary War is still fresh in settlers' minds as a young man named Peter Loon sets off at his mother's urging to find a mysterious person. Peter, who has never been away from his home, quickly falls into a series of startling entanglements. He befriends a nomadic parson with a seafaring past and whose humble intelligence and steady head prove useful, especially when the two find themselves in the middle of a bitter land battle. Crisscrossing between the two sides, Peter and Parson Leach tread the razor-thin line between law and justice. 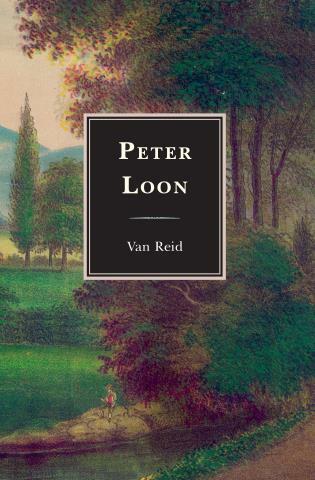 With the inimitable storytelling, exquisitely etched characters, and gentle humor that make Reid such a master, Peter Loon is a breathtaking tale of high adventure and great humility. Van Reid's family has lived in Edgecomb, Maine, since the 1800s. Reid was a long-time bookseller and lives with his wife and children in a house Reid and his brother built on their family's land. He also wrote a series of novels about the Moosepath League which take place in the late 1800s on coastal Maine.